We have just lauched a campaign on indiegogo’s website, in order to obtain the funds we are missing to finalize our project Exodus. If you wish to participate, you can share the link to our campaign to friends of yours which might be interested, and you can also participate financially. 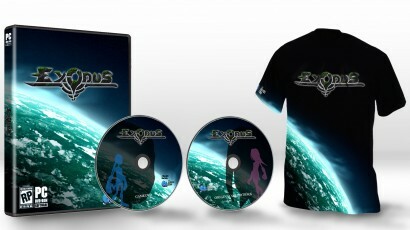 Several perks are available, with different contents : Digital and physical version of the game and the OST, plus a T-Shirt for the higher perks. If you wish to participate financially, keep in mind that the campaign have been created to support the developpement. The perks including physical content may not be the most competitive ones. On the other hand, the digital version is proposed at 12 $, but the game’s price will increase a little bit when it will be released, to reach about 18$. They left Paris on sunday 4 and it’s only after a whopping 16 hours flight (layoff in New York) that the team could settle in their room, not to get some rest but to prepare Galhmac’s stand. The event took place in the magnificient Sir Francis Drake hotel (although Naughty Dog was nowhere to be found !) right next to Union Square. Every participants had a room for their meetings, giving an unfaltering sense of confidentiality, which was a drastic change compared to some of the open-space we got from the Games Connection in Paris. We were free to roam around the hotel as we liked, but it was near-impossible to eavesdrop any meeting if you weren’t invited. Then comes the fateful time of our meetings, and they were presented in the form of brief speed-datings lasting from anything to 30 minutes. Such a short time didn’t allows for lenghty explanations or to lead astray the investors with false promises. You had to show that your games were the best, and that they need them. You could think that half an hour is a decent time to get your message through, but in reality it is a very (too) short time to convince someone you’ve never met to invest in your projects. Our team gave the best of them so they could show the full potential of Galhmac Games Studio’s projects. Of course, all of our current projects were shown : Exodus, Happy Burst Day and The Big Feed. One important thing to note is that whatever comes out of it, we still were able to get in touch with some of the biggest companies and this can become a first anchor as to throw Galhmac right in the heart of the videogame industry. This is a very closed circle where everybody know each other, you have to fight your way in in order to be accepted and this kind of events (Games Connection) really helps you in getting in. The atmosphere was very pleasant and friendly, and quite a lot of people seemed interested in our projects. Even though there wasn’t any propositions « at first sight », we still have a lot of emails to send to the contact we made, to see where it leads us ! The amount of contacts we got is significant and I won’t say more here but there might be some bright possibilities in the near future. We’ll see. But some points weren’t all that great, because there is still an unbelievably high demand for project on Ios and Android, and for very casual gamers. We were starting to ask ourselves where the game industry is going, and what will happen to you when you’re a company making games for old-school lovers and not casual-gamers. Anyway this is a problem inhere in the video game middle, not just the Games Connection. As always, there are the evening cocktails, a easy way to relax after a hard day (not to mention when you start feeling the jetlag effects). Even then, the job is not finished ! You always have the chance to meet some persons from companies you couldn’t have meeting with, often requested, and you have to be on the lookout so you can get to them and have an unofficial meeting and get in touch around a drink. In the end, the only real time where you can relax and get some rest is when you sleep. The summary of this Games Connection is really positive, a lot more than when we participated in the one in Paris (Yeah, even if we were Selected Project, it didn’t mattered much). Now, we still have quite some work in trying to convince those investors via mails and get the best of it. Today is the official openning of Exodus’ website. Screenshots and artworks of the game. Many elements will be added progressively with articles explaining both the universe, the characters and gameplay elements of Exodus. For now, we invite you to discover available rubrics. To support us, please feel free to join us on Galhmac game studio’s facebook page, or follow us on Gameblog ( French ) and Twitter.